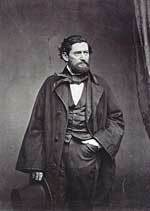 Ranger John Coffee “Jack” Hays was born in Little Cedar Lick, Wilson County, Tennessee, January 28, 1817. In “Texas Rising,” he seems to be a somewhat less important character, likely because most of his service as a Texas Ranger occurred after the Texas Revolution. Hays was related to Andrew Jackson’s family in that Mrs. Jackson was his great aunt. His father fought with Andrew Jackson and gave Jack his middle name Coffee in honor of Gen. John Coffee who had also served under Jackson.